My Blog friends gave to me..... Some yo yo's to make my sewing room fancy. Da da da da.... Introducing the wonderful, witty, super nice, and talented Katie from Lady Bird. Katie and her family live in the beautiful mountains of Virginia in a town called Charlottesville. 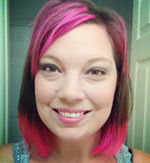 Katie is a fellow crafter who likes a little of everything, from Sewing, to knitting, you name it she will try it. Katie has two beautiful little girls, they call the oldest Lady, and the youngest Bird. Her youngest daughter is named Sophie just like my little one. Maybe Katie is like my long lost twin or something, Hey, I could dream right? After all we have so much in common. Katie stops by our blog to tell us what she loves about the holidays. Katie; I love the stillness of the holidays. Somehow even in the hustle and bustle of the holidays, there is a time embedded to pause and reflect. A time that doesn't seem to be present during other times of the year. I am so grateful for a season of conscious stepping beyond myself. I hope that as my girls begin to grow up they know the joy of serving others, the joy of reflecting, and the joy of stillness. And, of course, a good Christmas cookie! 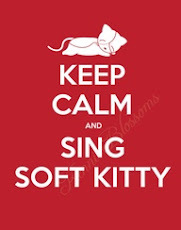 I would love to hang this in my dear daughters room! she loves things dangling from her ceiling! And it would soooo match her room! 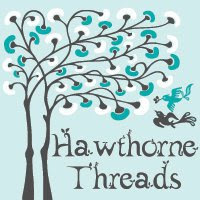 I left a comment on the Lady Bird Blog, it was "sew" easy to say something wonderful about what she has created! The room I would have this mobile displayed would of course be my new little angels nursery! It would even look good just hanging around any room in my home!! I have a link button on my blog that comes straight to yours that mentions the 12 days of Christmas!! What a very cool blog Katie has. I stopped by and left some bloggy hugs. 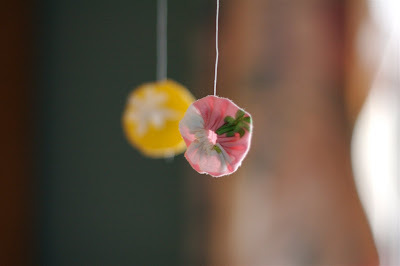 I would love to display this very cute mobile in my sewing room. 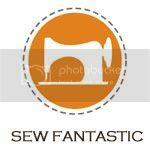 I am a follower of Sew-Fantastic! 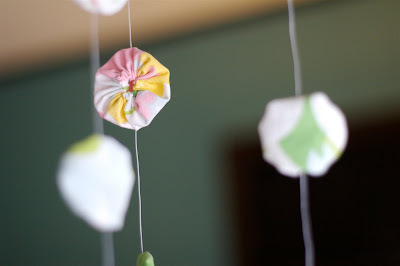 I can definitely see that darling mobile in my sewing room. What a great idea! I'm on my way over to visit Ladybird. Thanks for the heads up. I keep getting a message on Lady Bird's post saying that it is a duplicate message and I notice that she has no other comments. Are others having the same problem? how cool - I'd hang it in my enterance. Here's my one little entry... and I'd hang that lovely in my most favorite room - my sewing room! 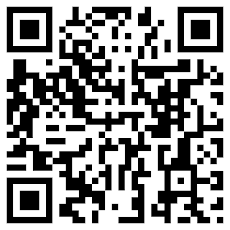 I follow your blog! Thank you for the fun giveaways! My sister lives is Charlottesville! I think I should win based solely on the fact that they probably know each other, but if I have to tell you where I would put the yoyos, I would put them in my little girls' room. We're moving the two girls in together to make room for the new baby that's coming in April. I would display this mobile in my dd's room. Would look lovely in there! I left her a comment. We'll see if she knows my sister! I would hang this above my newborn daughter's crib. I would give this to my friends little girl to put in her bedroom. Ive commented on Lady Bird's post. 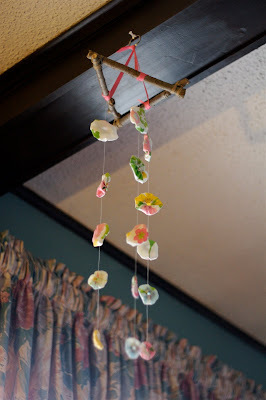 I would display this beautiful mobile in my daughters room! Gorgeous!